3.0 NON-RESONATED TURBO BACK EXHAUST SYSTEM. 3.0 / 76.2mm Pipework. Mandrel bends for optimum flow. Some systems will be made to order. Found this system cheaper else where? Remapping is recommend when fitting a hi-flow sports cat or decat pipe. Sports cats and decats may cause EML light to illuminate. A remap or lambda cheater may be required to stop EML light coming on when fitting sport cats/decats. Decat pipes are for off road use only and will not pass an MOT emmisions test. Sport cat systems will pass an MOT emmisions test. As a company we are committed to continuous improvement and investing in new developments, with a keen focus on quality and service our loyal highly trained team are always happy to help. The production facilities at Cobra Sport exhausts enables us to produce exhausts in high volume and having worked with clients such as Subaru UK, Isuzu UK and Ginetta Cars to name but a few. How are your exhausts made? All of our exhausts are made from aircraft grade 304 stainless steel and constructed using precision TIG welding with mandrel formed bends in the pipe work for a smoother gas flow. We pride ourselves in producing high quality products. What sound can I expect from your exhausts? Our exhausts will have a more sporty tone than original equipment exhausts. This is an inevitable result of the less restrictive systems we produce. However, with careful design and production methods, we aim to keep a subtle sporty tone. If you prefer a loud system, then one of our non-resonated (no centre box) exhaust systems will provide a louder exhaust note. Many of our products feature a movie of the exhaust and give some idea as to the sound which you can expect. What power gains can I expect to achieve? Of course this varies from engine to engine, our systems are designed and manufactured to maximize gas flow with increased diameter pipe work, free flowing silencers and mandrel bends which provide a much less restrictive exhaust system than original equipment exhausts, resulting in a much better engine response and increased BHP. Typically you can expect to achieve around a 10% increase from the installation of a cat-back system. Some individual products also show approximate power gains. Is it legal to put a de-cat pipe on my car? You can only de-cat your car if it was registered prior to 1992, otherwise it will fail the emissions check at your MOT station. Will my car need remapping? If you are fitting a cat back system to your car, this will have no effect on the engine management operations. However, if you are replacing your original system with a de-cat, sports cat or front pipe your car may need remapping as it may cause the vehicles engine management light to activate. What is the difference between resonated and non-resonated systems? Resonators are box chambers incorporated into the exhaust system, which are used to make the exhaust quieter, by cancelling certain sound frequencies. A non-resonated exhaust system will therefore, give a louder exhaust note and a resonated exhaust system, a quieter exhaust note. Either option will still provide extra performance. What is a Slash-Cut tailpipe? Slash-cut tailpipes are finished and cut off at a 15 degree angle, and suit certain types of vehicles depending upon the shape of the bumper and overall aesthetics of the vehicle. If you require any advice on which tailpipe would be most appropriate for your car, please give us a call. What will be the finish of my exhaust? All our exhausts come with highly polished mirror finish tailpipes and rear boxes. All other pipework and gaskets etc, will be a matt polished finish. If you do require highly polished pipework this is now available as an optional extra when purchasing via our website. How do I keep my exhaust looking like new? If you do not clean your exhaust/tailpipe, it will eventually become discoloured and be more difficult to bring back to its original finish. Regular cleaning with a non-abrasive metal polish such as Solvol Autosol® will ensure that your exhaust continues to look as new. Excluding These Postcodes / areas. AB10, AB31-AB39, AB40 - AB42, AB43-AB45, AB51-AB56. FK19-FK21, HS1-HS9, IV1-IV28, IV30-IV32, IV36, IV40-IV49, IV51-IV56, IV36. KA27, KA28, KW1-KW3, KW5-KW17, PA20-PA39, PA40-PA49, PA60-PA78, PH1, PH5-PH9, PH10, PH15-PH26, PH30-PH44, PH49-PH50, ZE1-ZE3. Northern Ireland, Southern Ireland, Highlands, Orkney, Shetland, Guernsey, Jersey, Isle of Wight, Isle of Man. We are dedicated to ensuring the highest possible quality service to our customers. We do not offer return on change of mind. 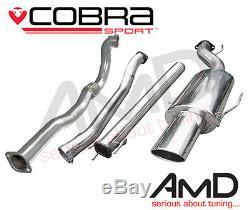 The item "Cobra Sport Astra G Coupe Turbo 3.0 Non Resonated Turbo Back Exhaust with decat" is in sale since Thursday, April 16, 2015. This item is in the category "Vehicle Parts & Accessories\Car Tuning & Styling\Performance Exhaust\Other Performance Exhausts". The seller is "amdessex" and is located in Grays. This item can be shipped to North, South, or Latin America, all countries in Europe, all countries in continental Asia, Australia.